The project is a collaboration between the Chicago Public Library, which has 81 locations throughout the city, and the Chicago Housing Authority, with a goal of providing housing and educational opportunities under the same roof. The new buildings offer 44 senior apartments, 30 CHA units and 14 affordable units in the Irving Park neighborhood; and 29 affordable apartments, 37 CHA units and 7 market-rate units in Little Italy. Another mixed-use building is expected to open later this year in West Ridge on the city’s North Side. And a new public library is slated for construction on CHA-owned land near the Altgeld Gardens public housing project on the Far South Side. The monthly rent for both CHA and affordable apartment units are set at 60 percent of the area’s median income – occupants of CHA units are eligible for further rent assistance through vouchers. The buildings were designed by some of Chicago’s top architects chosen from a design competition held by the city. John Ronan Architects designed Irving Park’s Independence Branch Library and Apartments (4204 N. Elston Ave.); the Taylor Street Apartments and Little Italy Branch Library (1336 W. Taylor St.) was designed by Skidmore, Owings & Merrill. The project underway in West Ridge is designed by Perkins+Will. The libraries will offer high-tech programming including 3D printing, virtual reality and robotics. 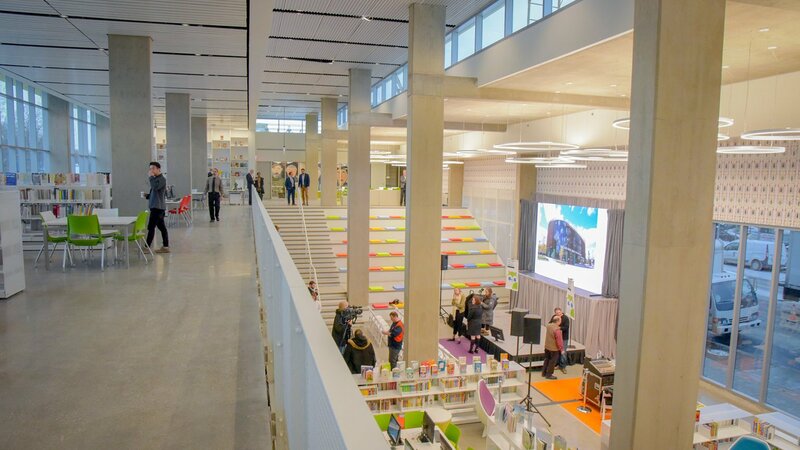 “The way we design these buildings is not only beautiful, but it also allows for the evolution of the kinds of services that we’re going to be providing through libraries long into the future,” said Chicago Public Library Commissioner and CEO Brian Bannon.